A couple of months back my Wacky Book of the Week was Zombie Haiku. You can read about it here. 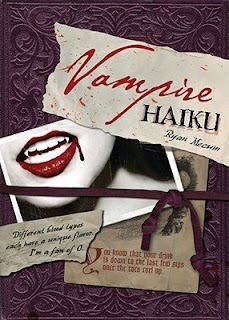 Well, the author Ryan Mecum is back with another one, this time from the point of view of a Vampire. Talk about timely! You hold in your hands a recently discovered poetry journal - the poetry journal of a vampire. William Butten was en route to a new land on the Mayflower when he was turned into a vampire by a fellow passenger, a beautiful woman named Katherine. These pages contain his heartbreaking story - the story of a vampire who has lived through (and perhaps caused) some of America’s defining events. As he travels the country and as centuries pass, he searches for his lost love and records his adventures and misadventures using the form of poetry known as haiku.As Butten documents bloody wars, a certain tea party in Boston, living the high life during the Great Depression, two Woodstock festivals, the corruption of Emily Dickinson, and hanging out with Davy Crockett, he keeps to the classic 5-7-5 syllable structure of haiku. The resulting poems are hilarious, repulsive, oddly romantic, and bizarre. I said it before and I'll say it again, this book, along with Zombie Haiku just isn't my cup of tea. I understand the point, the humour, but it's just too wacky for me, and as I've said before, I've had enough of vampires for a while! If this is the kind of humour that does it for you, you can see inside the book at Amazon.com or, if you live in Australia you can purchase a copy from Booktopia here. Huh...I have to agree zombie and vampire haiku sounds sort of weird. I mean I love vamps, but haiku? I don't think so. Just wanted to let you know I'm giving you the Honest Scrap Award. See you later. Keep it shiny!